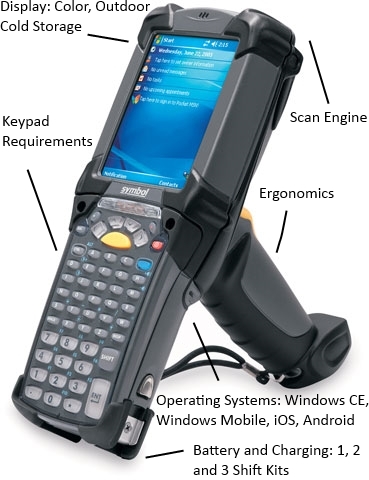 Ivanhoe has developed one of the industry’s most active mobile computer, mobile printer and barcode scanner rental and leasing programs. A wide variety of brands models and types of equipment stand at the ready. Our expertise goes back generations and spans nearly every model of equipment. Allow us to understand your data collection requirement and we will match and fill the requirement. Look before you leap. Experience tells us the best way to insure your inventory, asset tracking, trade show or wifi expansion projects success, is to get a test unit to you today. We’ll step you through the questions that need answers to make this work. After almost two decades in the data collection business, we know where to start and how to insure a smooth project. Matching the equipment hardware and software features that you use now is preferable. Making certain of configuration is our focus. Operating systems: Pocket PC 2002, 2003; Windows Mobile 5.0, 6.1, 6.5; CE 4.2, 5.0, 6.0; Windows Emb, iOS and Android. Connectivity: TE, TE2000, for ANSI VT220/320, 5250, 3270. Wavelink and Stay-Linked. Hardware: Alphanumeric and Numeric keypads, Scan engines, Imagers to Near/Far fourth rack reach. Special consideration: Batteries and chargers for three shift operations, cold storage for extreme temperatures. Contact us with your time frame and requirements. We are part of your team. Letting us know the model and configuration number of your current units allows us to best match rental units to your environment. Some of our users have heightened security needs, or require specific emulation programs to operate in their environment. Do you have any of these requirements? Let us know how many units you need, we'll also include batteries for each unit, and gang chargers to keep them topped off.